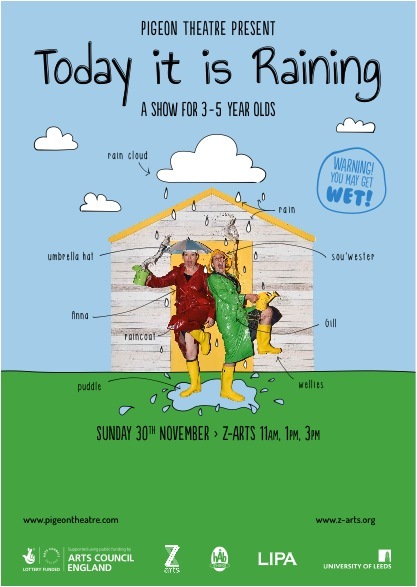 Coming this Spring: Pigeon Theatre’s new children’s show for 3-5 year olds. Today it is Raining is available to book for Spring 2015. Our premiere is at Z-Arts this weekend. Show times 11.00am, 1.00pm and 3.00pm. Book early to avoid disappointment! the stories and the characters in the books are slowly taking over. 30 minute show with 15 minute post-show playing. Very limited capacity. Today it is Raining tours the UK this Spring 2015. It is supported using public funding through Arts Council England. Also supported by Z-Arts, hÅb, the University of Leeds and LIPA. Pigeon Theatre are a Manchester based contemporary performance company. Our work is experimental and interactive – we use non-traditional spaces and unconventional social engagement to create shared intimacies between ourselves and our audience. We have been making and touring innovative theatre since 2001. This is our first children’s show.